TRIVIA of Noh : Q70 : How much preparation time is needed for the large tabor? | Home | Trivia | Q70 : How much preparation time is needed for the large tabor? How much preparation time is needed for the large tabor? From the shape, you might think that the difference between a small tabor and a large one is only the size. In fact, the structure of the instruments is the same: a sandglass-like body made of cherry wood, with a horsehide head at each end. But because a large tabor needs to produce high-pitched tones, it has to be tuned in a unique way. The tighter the horsehide heads are stretched, the higher the tones become. 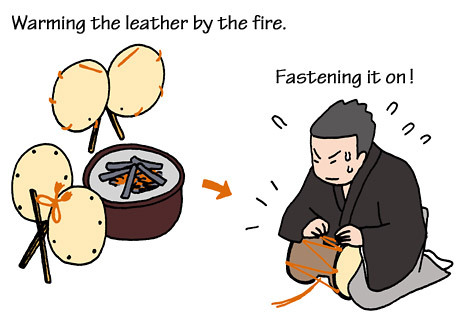 In order to do this, the player heats and dries the pieces of horsehide in the dressing room from two hours before the performance. Charcoal braziers have been used since the earliest times, but these days electric heaters are also used. All year round, players prepare their instruments while dripping with sweat. To complete the job, the player the holds the body of the instrument and stretches the dried horsehide tightly. The time the player spends on preparation before he appears on the stage is longer than his playing time. A large tabor is pounded with a forceful hand to give a masculine sound, so the heads tend to get damaged. Therefore, durable horsehide, such as that from the rump, the back or the shoulders, is used.